Mr. Velasco graduated from Princeton University and majored in East Asian Studies and mainly works with senior students. His research allowed him to explore the policies and China and Japan, and he was able to take several trips abroad and enjoyed his time studying in both countries and learning the languages. 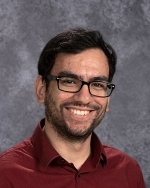 Mr. Velasco dedicates most of his free time to advising stduents and sponsoring extra-curricular activities such as the Anime club, the National Honor’s Society, and ACT prep.